Bolte Taylor writes in her introduction about the organization of her book. Chapter One: Jill’s Pre-Stroke Life is about her life and educational history, as she talks passionately about her education and research. Readers learn about the genesis of her interest in the brain as she speaks fondly about her brother, who was diagnosed with schizophrenia at age 33. Bolte Taylor encourages the reader to read the science and anatomy-based chapters in the beginning to better understand her stroke story. Speech-language pathologists and communication disorders students will enjoy this review of information that takes them back to their anatomy, physiology, and neurology classes. Her passion for helping others through her research, studies, and teaching is apparent throughout the chapters. Bolte Taylor’s hemorrhagic stroke rendered her unable to speak, read, walk, and perform many daily life functions. Bolte Taylor speaks about her frustration as a person with aphasia, giving her perspective on a platform that will hopefully help others to understand the perspective of people with aphasia. Once a bustling professor and scientist, Bolte Taylor now had to relearn independence. She writes of her gratitude for her mother for being her caregiver and care partner, as well as the friends and colleagues who supported and cared for her throughout rehabilitation. Bolte Taylor offers a detailed look into processes of the brain for which she had newfound consciousness. As a reader, I found myself thinking deeply into just what I was sensing, perceiving, and thinking, seeing a small portion of the processes I simply take for granted. Bolte Taylor’s perspective as both a person who has had a stroke, a person with aphasia, and a neuroanatomist is incredible, as she thoughtfully details her journey from onset to recovery. Many of Bolte Taylor’s recommendations are based on support from family, friends, and allied health professionals. Many of her recommendations are based on life participation and prioritizing what the person with aphasia wants from their recovery. Speech therapists will enjoy reading about Bolte Taylor’s speech therapist Amy Rader and Bolte Taylor’s experience going to speech therapy. Bolte Taylor’s ultimate goal is to write information that will help people, as well as provide comfort to their family, members, friends, and community. Within the book, her passion for the brain and compassion for others is apparent in her writing. One of the greatest things we can do for anyone with a communication disorder (or anyone, for that matter) is to simply listen. As students and professionals who study communication disorders, we are familiar with the fact that every client has different goals for therapy and different ways of viewing rehabilitation and recovery. As a neuroanatomist, Bolte Taylor has unique perspectives that we have not heard in our classes or from other clients. I encourage any reader to relax and listen to Bolte Taylor’s unique voice and quick wit as you read her story of rehabilitation. About the Reviewer: Ellie Howton is currently pursuing a master’s degree in communication sciences and disorders from Minnesota State University, Mankato. Her research interests include life participation and how it relates to communication and cognition for people with aphasia. 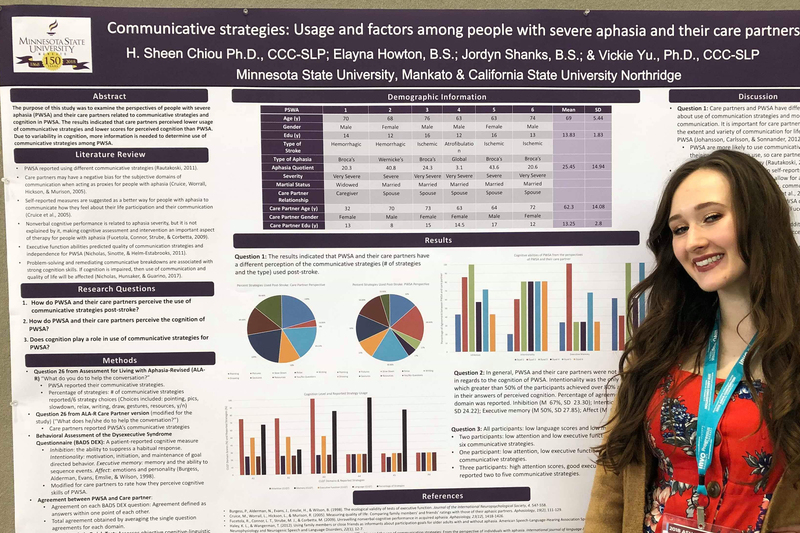 She would like to continue her education by pursuing a doctorate in Communication Disorders and Sciences with research focuses in aphasia rehabilitation.